Khosrowshahi is going to unclog that pipeline of getting women into leadership roles. Shortly after taking the helm as CEO of Uber, Dara Khosrowshahi read the now-infamous report on the beleaguered company’s culture, it was bad. Real bad. He had to take breaks, he admitted in an on-stage interview with legendary journalist Tina Brown yesterday at the Women in the World conference in New York City. Uber has had to do a bit of soul-searching in the past year or so. 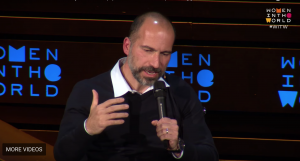 There was the viral blog post from female engineer Susan Fowler that revealed the company’s toxic culture of serial harassment, eventually leading to the ousting Khosrowshahi’s predecessor Travis Kalanick. There was a massive data breach that came to light more than a year after it happened, and the lawsuit against self-driving car company Waymo. And most recently, an autonomous vehicle killed a pedestrian in Arizona. All this has been, understandably, bad for business — users have been deleting the app in droves, and the company’s stock tanked. Khosrowshahi knew the company was in crisis, of course (though some of the above happened after he became CEO). But in some ways, that makes things easier to shake up. “The crisis was so big that I didn’t have to convince anyone to change things,” he said. He was drawn to the company because it presented a unique opportunity to make a difference in the world; if Uber was going to do that, Khosrowshahi knew the company’s values had to shift. Late last year, after extensive crowdsourcing, voting, and focus group testing, Khosrowshahi released the company’s new norms, such as “We celebrate differences” and “We do the right thing.” Yes, these new values sound cheesy, but it’s a dramatic shift from the “hustlin'” and “toe-stepping” of the past that allowed such rampant and destructive behavior at the company. “It’s clear that the culture and approach that got Uber where it is today is not what will get us to the next level,” Khosrowshahi wrote in a post about the new norms on LinkedIn. Khosrowshahi noted that this takes time and investment. Too many companies focus on recruitment when they talk about women in leadership. Uber has done that, he said, but he’s really most interested in development “Recruitment is like a sugar high,” he said — if you really want women to be in charge, it takes years. He points to his time at Expedia, in which he put forth a conscious effort to raise the number of women in charge from about 15 percent to 25 percent. “It took years to do so because it took developing women, shaping them, working with our culture, making sure you move them to the right places in the company,” Khosrowshahi said. He seems to imply that they could do the same at Uber.